What are local employers doing now to find professional and skilled workers? With the recent economic downturn, we are seeing a lot less employers who come to us because they cannot find qualified professional or skilled workers. This is a good thing for the local economy. There is finally starting to be a better balance between local employer needs and available workers. But, there are still employers in the Sarasota area who have particular needs and are not finding local workers who can fill those needs. This includes professional jobs that involve software and technology, engineering and international trade. It also includes skilled jobs that involve restaurants and hospitality services, specialized construction and manufacturing trades, and more advanced agricultural jobs. In immigration circles, a “professional” job is one that requires a university degree. A “skilled” job is one that requires at least two years of education, training or prior work experience. So what are these employers doing now to find these professional and skilled workers? They are expanding their recruiting efforts outside the local area and some have been exploring different immigration options to bring in workers from outside the U.S. In most cases, Sarasota area employers are not actively recruiting foreign workers. Usually, they already have a worker on staff that can do the job and originally comes from another country. A common refrain that we hear from employers is, “If I could get ten more workers like her, I would be thrilled!”. For professional workers, our solution used to be the H-1B visa. This is a three year visa for professional-level workers. But, this visa is limited in number. In the past two years, the government has received over twice the number of applications for new H-1B visas than there were visas available on the FIRST day of the year that visas were available. This means that H-1B visas are essentially unavailable for 364 days per year (certain nonprofit organizations are not subject to the annual cap). – The TN visa for certain kinds of professional workers from Canada or Mexico. The visa is issued in one year increments and is renewable. The government may soon allow the visa to be issued in three year increments. – The H-1B1 for professionals from Chile and Singapore. – The E-3 visa for professionals from Australia. Though these visas are limited to workers from certain countries, we have advised employers on bringing in engineers and engineering technicians from Australia, Mexico and Chile, hotel managers and consultants from Canada, and more. The options are even more limited for skilled workers. The best options at this point are H-2B visas for seasonal employees. This visa is also available for unskilled workers, but like the H-1B visa there are only a limited number of H-2B visas available each year. Ever wonder how hotels get all those foreign workers on the cleaning staff? Often these workers have H-2B visas. – The J-1 visa or H-3 if the worker is seeking to participate in a training program or internship. – Extended Optional Practical Training for foreign students on F-1 visas who have degrees in science, technology, engineering and math related subjects. – P-3 or Q-1 visas if the worker will provide information about topics that are unique to his or her culture (we have used this visa for a Scandinavian sailor, European culinary specialists, and Latin American dance instructors). As the economy improves, we expect to see more employers that are unable to find professional and skilled workers. As Congress considers changes to the immigration laws, one big area of contention is increasing the number of visas for temporary professional and skilled workers. We hope that people in the Sarasota area will see that approving such measures will help the local economy by allowing local companies to grow. We believe that pro-immigration legislation will actually help Sarasota retain the jobs that are filled by U.S. workers and will keep more of our local companies from relocating elsewhere. The New York Times recently published an article called, “Employers Fight Tough Measures on Immigration” by Julia Preston. 1. How to comply with laws that prohibit employment of unauthorized workers while at the same time complying with laws that prohibit discrimination against workers (anti-discrimination laws prohibit employers from requesting specific documents to verifying a worker’s legal status)? 2. How to deal with experienced, long-time employees when an employer learns that the worker may not be authorized to work? These workers know the job, are willing to work and would be difficult to replace. 3. How to find new workers who are willing and available to do certain jobs even at competitive wages? Many employers have found that the nature of a particular job or tight local employment levels make some jobs nearly impossible to fill. The article cites a number of efforts that employers are making at the state level to combat the rise in immigration enforcement laws by state governments (which may turn out to be unconstitutional). It also mentions a new pro-immigration federation called, ImmigrationWorks USA . Its website is: www.immigrationworksusa.org. This is a new national organization advancing immigration reform that works for all Americans – employers, workers and citizens. Its twin goals: to educate the public about the benefits of immigration and build a mainstream grassroots constituency in favor of an overhaul. The Sarasota Bradenton area has been known for years as a hub for sports training–particularly tennis. 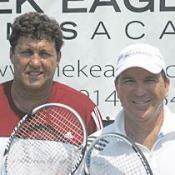 Now, some famous names have decided to base their new tennis academy on Longboat Key. Johan Kriek and John Eagleton have opened the Kriek Eagleton Tennis Academy at the Longboat Key Club and Resort on Longboat Key, Florida. The academy works with players of all ages, but targets students under 20 years old. Part-time and full-time options are available along with short-term training options. The academy works with local schools to offer a flexible schedule that allows for training and academics. Like other local tennis academies, Kriek Eagleton expects to include a number of international athletes among its students. Parents of international tennis athletes often prefer to have their children train in America due to the high caliber of instruction, the quality of the education, and the cultural experience. Kriek is an internationally renowned player who was ranked in the Top 10 in the world. He won the Australian Open in 1981 and 1982 and has 14 singles titles and eight doubles titles. Eagleton says of Kriek, “He might be the highest-ranked player to ever commit to being on the court”. Eagleton, formerly ranked No. 1 at the University of Miami for 3 years in singles and 4 years is doubles, has wins over many top players at the professional level. He is an ATP tour-certified professional who has established himself as a highly respected coach. He has developed players to reach state, national and NCAA championships and has helped many students attain scholarships to top universities.